At the beginning of WW2, an Army Air Corps man says goodbye to his Harvey Girl at famous "The Castaneda" in Las Vegas New Mexico. 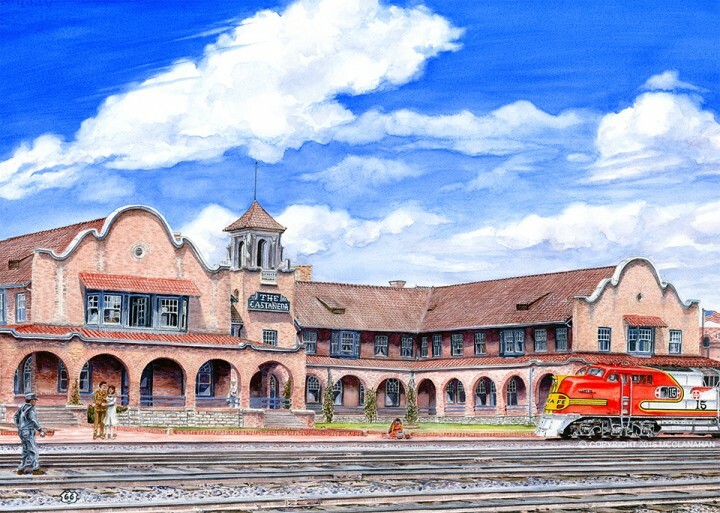 This new painting had its first (and perhaps only) pubic showing at this former Harvey House on the Santa Fe railroad (now being restored) on August 5, 2016 at their open house. Only 15 of these 14.5 x 16 image size prints were made and signed/numbered at the event. Your16 x 20 mat will allow room at the bottom for the date title, numbering and signature to show. Price: $150.00 plus shipping (to be determined). mcjerry@attDOTnet. Replace DOT with . Contact me directly for details or to purchase.